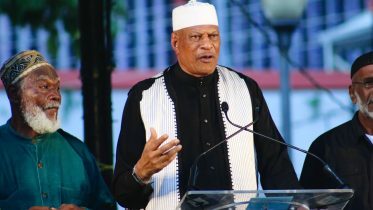 The year 1838 marked a historical time on our calendar because it led to the rebirth of Islam (following the demised of the religion amongst the African Muslims in Guyana). It was in the year 1838 that 94 Hindustani (Indian) Muslims arrived in the colony of British Guiana on board the first two “coolie” ships – the Hesperus and the Whitby. This account debunks the myth that Muslims were not among the first set of indentured immigrants to the colony. We are once again observing the holy month of Ramzaan, and we would like to share with your readers a bit of our early Muslim ancestors in Guyana. Today we take you back to a journey in time when the second wave of Muslims began arriving on the shores of Guyana. The year 1838 marked a historical time on our calendar because it led to the rebirth of Islam (following the demised of the religion amongst the African Muslims in Guyana). It was in the year 1838 that 94 Hindustani (Indian) Muslims arrived in the colony of British Guiana on board the first two “coolie” ships – the Hesperus and the Whitby. This account debunks the myth that Muslims were not among the first set of indentured immigrants to the colony. After slavery was abolished, the British turned to India for cheap labour which ushered in the period of indentureship and this led to the second wave of Muslims to South America, and since then Islam remained strong in Guyana notwithstanding the many obstacles that Muslims faced since their arrival and amidst a sea of evangelism. Based on the information compiled from the two ships’ logs of the immigrants 94 passengers, or 21 per cent of them were found to belong to the Muslim religion; the second largest group after the Dhangur tribesmen and women. Interestingly enough, from the Islamic names of some of these Dhangurs it is apparent that they may have converted to Islam prior to their recruitment as an indentured servant, however, on the embarkation list Dhangur and other castes were recorded as their scheduled caste. The Whitby was the first to set sail from Calcutta on Saturday, 13th of January 1838 with 267 immigrants and after 112 days at sea it dropped anchor off the shores of Berbice on that eventful day, Saturday 5th May 1838. A total of 181 immigrants were unloaded – 166 men, six women who accompanied their husbands, two boys, five girls and two infants whose gender were not stated. Of the 166 males, 45 were Muslims, two of them – Ally Buckus and Chummare – were recruited to serve as mates on board the ship. Of the 45 Muslim men, five were teenaged boys ranging between the ages of 14 and 15 who were registered as indentured laborers to be paid wages in the amount of six farthings monthly. Among the six women only one was a Muslim – Sheebah, aged 18 years, who accompanied her husband, Beejo number 92 in the embarkation register. This first batch of our ancestors was “bounded” to Plantation Highbury, East Coast Berbice, which was owned by Messrs. Davidsons and Company and administered by John Cameron. Having unloaded its human cargo in Berbice the Whitby then sailed to Demerara where the balance of the immigrants – comprising of 82 men, two women, one boy and one girl – were unloaded all of whom were indentured to James Matthews, Plantation Bellevue, Property of Andrew Colville, esq., of London. One Muslim man, Nophur aged 25 from Bancoorah (District of Bankura), State of West Bengal died on the voyage, while another Muslim – Jhurri – whose name did not appear on the embarkation list, was shown as having disembarked with the other passengers. Of the 82 men, 17 were Muslim one was a sardar, Nuthaw Khaw (spelt Nertha Khan on the disembarkation list) while, Jhurreechuck (shown as Thurry Huck on the disembarkation list) served as a mate on board the ship. Khan converted to Christianity shortly upon his arrival in the colony and was looked upon favorably by the Minister of the Parish . This trend of converting to Christianity continued throughout the years in the colony. 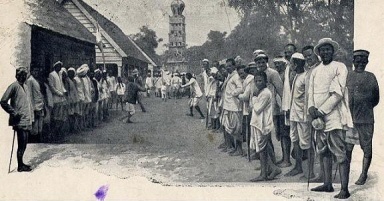 Up until 1966 those Indians who converted were given preferential treatment and considered more suitable for certain jobs both on the sugar plantations and in the Public Service over the other Indians who choose to follow their Hindu/Muslim religion even though in some cases they were just as qualified as the ones who converted to Christianity. The second ship – The Hesperus, laden with 171 passengers, departed Calcutta 16 days after the Whitby for British Guiana on Monday, 29th January 1838 and landed later the same day as The Whitby on Saturday 5th May 1838, at Port Demerara with 157 servants– 141 men, 6 women, 5 boys and 5 girls (which meant that 14 immigrants on the Hesperus died during the voyage). Ninety-four men and 2 women were bound to John Gladstone owner of Plantations Vreed-en-Hoop and Vriedestein. Among this batch of indentured servants on Gladstone Plantations 14 were Muslims, one of them – Jeewoon Khaw (Irrwan Khan) was accompanied by his wife (Bharrupp), there was also one Pathan – Coda Buckus, aged 26 or 27, from Ara, Bihar. The remaining 61 immigrants from the Hesperus comprising 47 males, 4 women and the 10 children were bounded to John and Henry Moss Plantation at Anna Regina, Essequibo. Among this latter batch there were 11 Muslim men, one of the men, Uckloo, was accompanied by his wife and four kids. At least two Muslim men died on the Hesperus – Soonawoolah, and Kryamt; while one immigrant – Kyut Alle – whose name did not appear on the embarkation list was shown on the list of passengers that disembarked from the vessel. 2 Comments on "1838 First Indian Muslim Arrival in Guyana"